Coastal Bend College is proud to announce the arrival of the 2014 Coastal Bend College Wildlife Calendar. 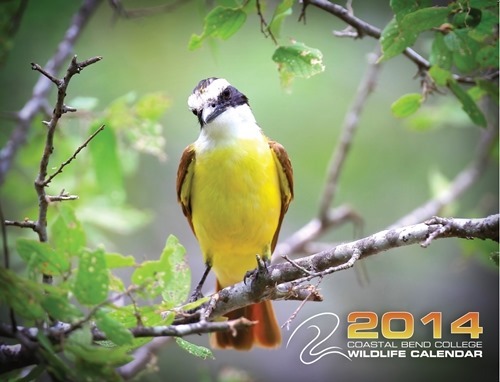 The 2014 CBC Wildlife Calendar features over 40 stunning photographs showcasing South Texas birds, animals, vegetation and flowers that are native to the area. The calendar would not be possible without the work of the following local photographers: Cissy Beasley, John C. Breidenbach, Armando Musquez, Sylvia Garcia-Smith, Sara Schirmer, and John West of Beeville; Erynn Studlar, Bobbie Waldron, and Janice Webb of George West; Connie Black of Mathis; George Gilchrist of Papalote; and Steve Kotzur of Pettus. Free copies of the wildlife calendar are available at all Coastal Bend College locations, Alice Chamber of Commerce, Beeville Chamber of Commerce, Kingsville Chamber of Commerce, Pleasanton Chamber of Commerce, Beeville Bee-Picayune, Hogue’s Jewelry (Beeville), and the Wicker Basket (Beeville) while supplies last. Any questions or inquiries about the wildlife calendar can be directed to Monica Cruz, Manager of Marketing & Public Relations for Coastal Bend College at (361) 354-2258 or via email at mcruz@coastalbend.edu.